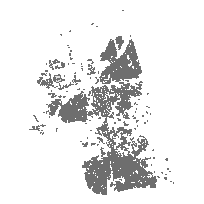 The dataset contains building footprint outlines for all non-residential buildings with a footprint greater than 2000 sq ft. and all multi-residential buildings with a footprint greater than 2000 sq ft within Waterloo Region. This dataset is derived by the Corporation City of Cambridge. The footprints were digitized from various aerial photography products covering Waterloo Region or were imported from a building footprint dataset supplied by the City of Kitchener. This dataset was created for use as a reference layer for digital and hardcopy maps and applications. This data should not be used as a measure of building square footage, as the individual polygons only represent the square footage of the footprint at ground level as visible from aerial photography. The building may or may not have multiple floors of varying areas.